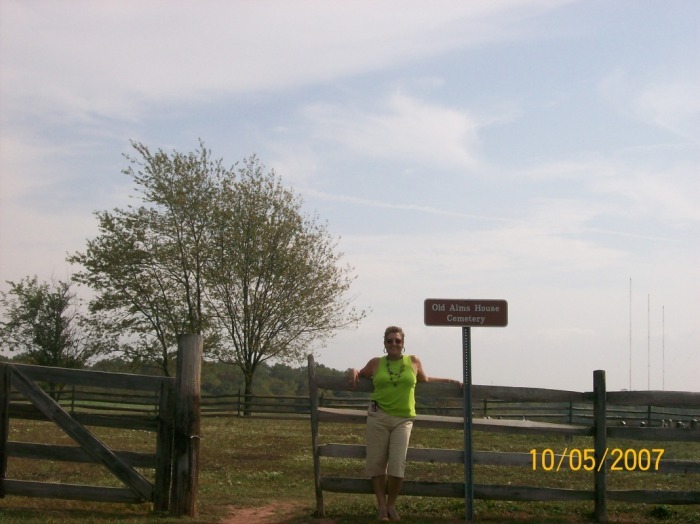 A few years later another visit was made to Gettysburg. There are certain areas in the park which have become famous for their documented haunting, like the Jenny Wade House or the haunted orphanage, however when walking amongst these monuments, especially if there are no other tourists around, which was the situation on this cool, April day when I visited, it's very easy to feel and hear those that do not rest easy along the periphery of your senses. Despite the efforts made by those who survived and erected these beautiful memorials, stone and metal I don't think can lay these ghosts who are stuck in between planes, tied to the place and time when they lost their lives during one of the battles that endured for those 3 days in July. 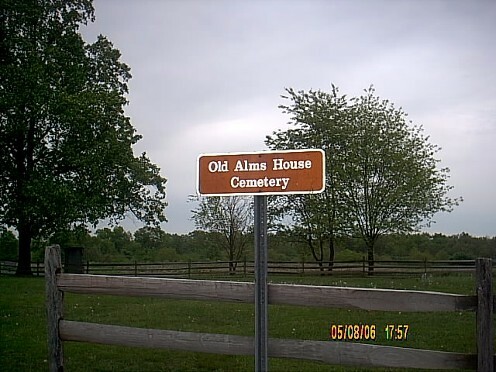 The Old Alms Cemetery is but a tiny, little cemetery which sits smack dab in the far corner of the Gettysburg National Park. This cemetery is quite old and predate the battle which was found in Gettysburg in 1863. There was an old boarding house on the site where mostly indigent people lived. 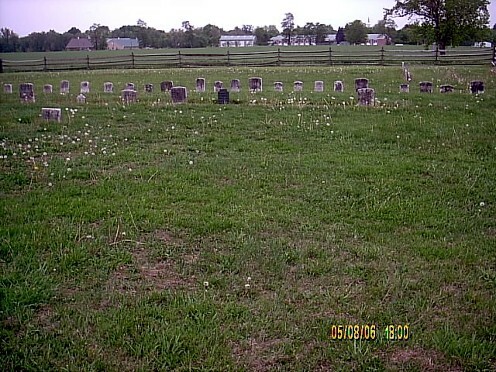 As the boarders aged and eventually died, there were buried on the site. As years passed, more people were buried on the site and eventually the old home was torn down leaving the cemetery behind. 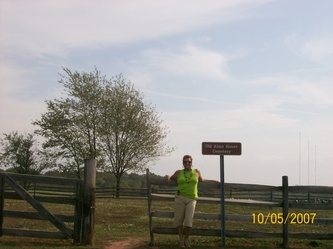 Formerly Blocher's Knoll but renamed after Francis Barlow's troops were overrun and killed after a foolish decision by Barlow. Barlow's troops retreated after being attacked from two sides and being placed on a very bad location. Many different forms of paranormal activity have been associated with this place. Orbs captured while visiting an old masonic temple with another FPRF member, Charles Del Campo. Employees at a Winnipeg restaurant converted from an old Masonic Temple believe the place is haunted. Some refuse to be in the building alone because lights flicker on and off and objects move by themselves. But the ghost doesn't seem to mean any harm. In fact, when wait staff return to work in the morning, it's as though he's had a party in the restaurant overnight. Salt and pepper shakers have been moved and napkins used. KENT (OHIO) - Spend a little time upstairs at the Masonic Temple and you might just see her. 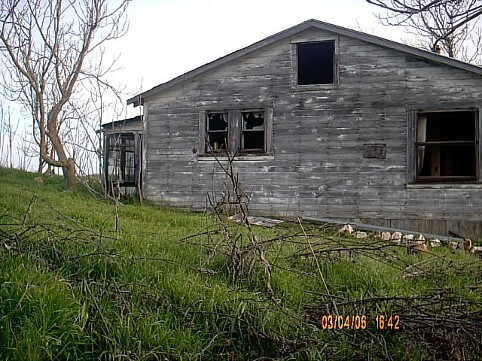 The ghost of Kitty Kent, who was fatally burned filling an oil stove inside the house in 1886. She makes an occasional appearance in a white flowing dress, unwilling for some reason to move on to the other realm. Or so the ghost story goes. The town was founded by Mexicans who were run out of the neighboring town of Quartzburg for the crime of being Mexicans. In its heyday Hornitos was a wide-open camp whose streets were lined with fandango halls, bars, and gambling dens. 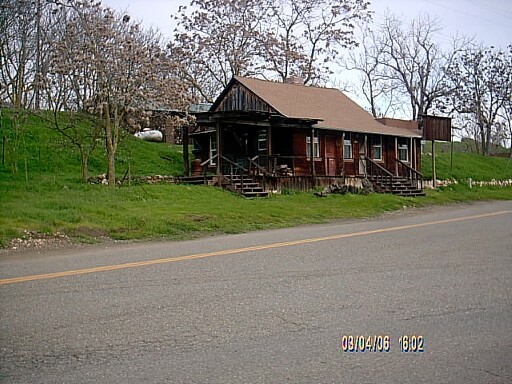 But the town was never the same after it was invaded by the "undesirables" from neighboring mining camps. During the gold rush Hornitos was the meanest town in the Mother Lode. 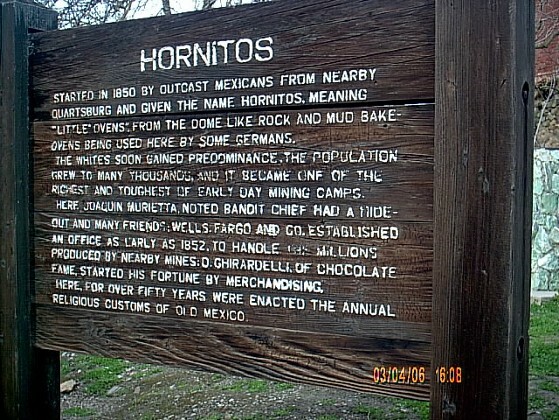 Population of about 15,000 people Chinese, Mexicans, Germans, and Italians all came to Hornitos to strike it rich. Now only about 50 to 75 people live in Hornitos, but you can feel the spirits of the ol` timers there. This is not the quiet, still town that it appears to be. The spirits of two women prostitutes who fought with knives till only one was left standing can be felt in the town square. The fight was over who a miner belonged to as a client. After the fight the miner was long gone. If you stand still and listen you can hear the screams of the women as they fought and the cheers of the miners who stood around and watched. Another miner roams around the jail house where he died. Accused of stealing a horse he was placed in the town jail. 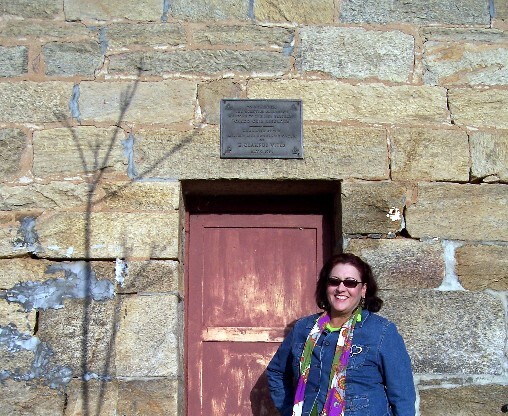 The jail is still standing today and is about 12' X 12' and has two windows about 1` square and is built out of brick. Cowboys who were drinking in a local bar decided to go to the jail and told the miner if he tied a rope around his waist they would pull him through the window. The miner did so and the cowboys pulled and pulled until they broke his back and he died. The miner never rested his soul and can be felt walking around the jail. 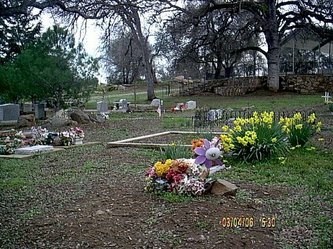 A young Mexican girl who died at a young age from perhaps a disease outbreak was buried on top of the ground with bricks and stone placed over her. 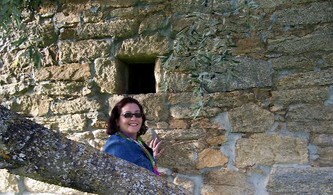 Through the years tourists have stolen those stones and bricks from her grave leaving it uncovered. You can feel her searching for those stones to cover herself and lay at rest again. The name of the infamous Mexican bandit, Joaquin Murieta, is still associated with Hornitos as he was almost captured there in the early 1850s, but escaped. 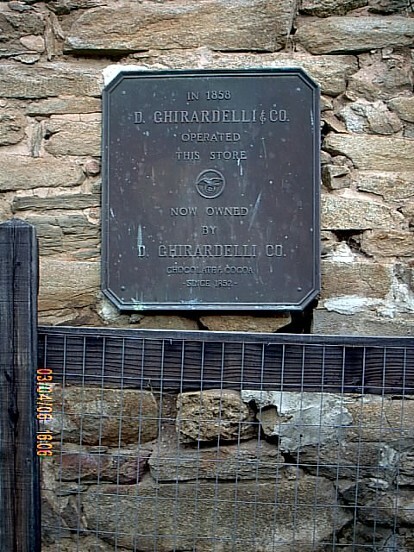 As well as the well-known chocolate make of San Francisco D. Ghirardelli & Co., who established The Ghirardelli Store (1858). Anyone who steps into Hornitos streets will find that they have stepped back into the 1800`s. Shooting and stabbings occured daily there. So many people came to Hornitos to find a new life only to usually die tragic deaths. I visited Hornitos with a good friend of mine, well known psychic & shaman Sunfox. Movies and TV programs shot here are: High Noon, Pale Rider, and Little House on the Prairie. 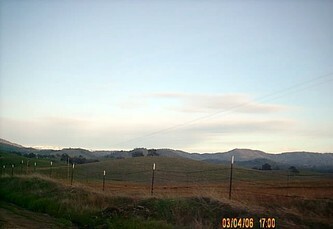 In March of 1850, the Hildreth brothers happened to camp in the area during an until-then unsuccessful search for gold. It had rained during the night, so they hung their blankets up to dry. With time on their hands, they did a little panning and soon discovered how rich the soil was with gold, minerals, and other gems. When other prospectors noticed how much time they were spending in the locale, it was quickly teeming with hundreds of men. People soon found they could pull a clump of grass from the ground and find gold nuggets in its roots. Within a month the population peaked at 6,000. By the end of 1852, there was more than 150 businesses; such as stores, saloons, and hotels; in the town to support the miners. After California became the 31st state to enter the union during September 1850, Columbia lost the honor of being the Golden State’s capital to Sacramento by two votes. As the price of gold began to dwindle in the 20th century, so did the town’s major industry. By the 1940s, most of the serious mining had ceased. On the other hand, unlike so many other former boomtowns, it retained a small population and, although deteriorating, it avoided becoming clusters of abandoned, derelict buildings. 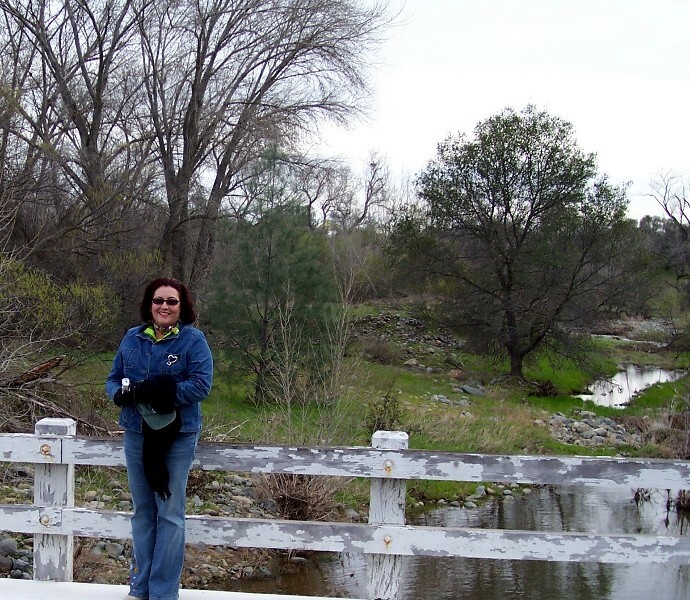 Located in the Sierra Foothills, it is such a pretty area many of its residents will never leave. 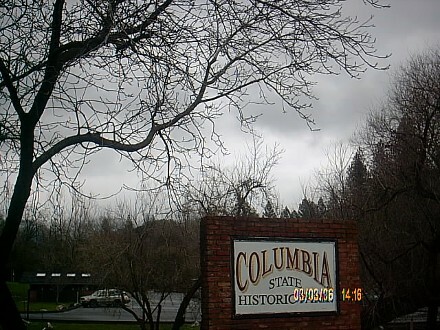 Columbia’s downtown area was established as a state park in 1945 and since then the state government has gradually been buying up all of the buildings built during the Gold Rush period and preserving them. 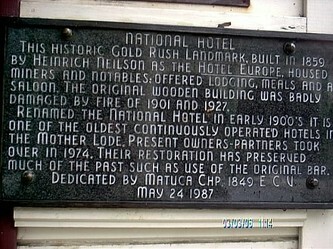 The most commonly known haunted buildings are The City Hotel and Fallon Hotel. The aforementioned has the ghost of a grieving young mother, who staff named Elizabeth, while children staying at the latter have reported seeing a little boy who urges them to see the dancing girls in the theatre. Between not wanting to spoil all of the details of the ghost walk and wanting to learn more of Columbia’s ghost folklore, I asked around the stores and succeeded in learning a few. The Columbia Mercantile staff still babysits a girl who is believed to have been the little daughter of a previous owner and died of “the fever” at the age of seven. They call her Lizzy. Most of her phenomena takes place at the back of the store. She is known to knock merchandise off the shelves. Occasionally, they hear her giggle. One of the employees, Gaylin, said a past employee has seen a little girl with long, dark hair walk into the back room. 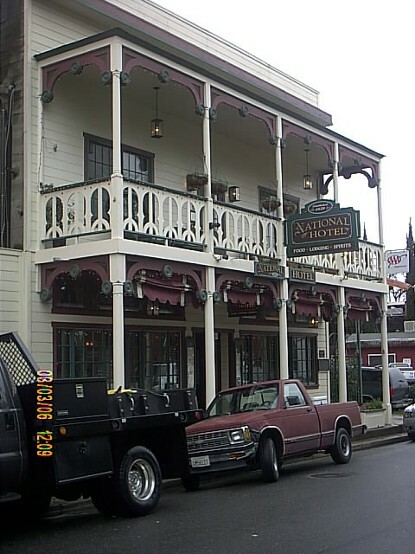 A sign at the St. Charles Saloon warns punters to “Beware of pickpockets and loose women.” Donna, who works there, says they have no ghost stories, but swears she’s seen a few shades standing off to the side as she works there. She claims she’s even seen lights moving around at The City Hotel when it was supposed to be shut down for a couple of weeks and had no staff around. She believes it was Elizabeth moving about there. 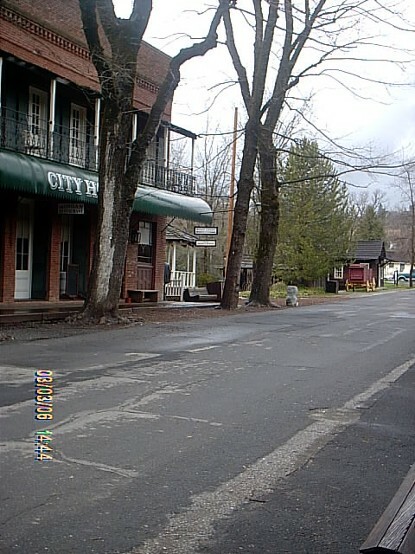 Eliot, at Columbia Booksellers, claims that a psychic who visited the area told him of couple of adult male ghosts who hang around the covered wagon exhibit at the north end of Main Street. She said they were still in shock after dying in the fire of a building on that spot. The schoolhouse is also reputed to have quite a bit of phenomena. Caretakers have tried to set up the display of a working classroom during the 19th century, but everytime they have tried to place a second grade reader on one particular desktop, it is soon found shoved on the floor. Perhaps that pupil feels he has graduated from the second grade and is insulted by the insinuation. 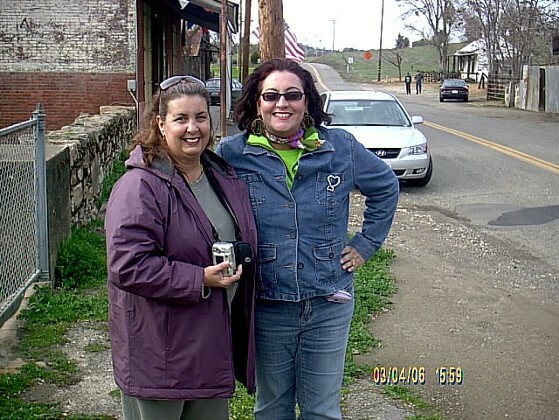 Before the previous owners of the Sierra Gold Tea Company sold their business, which is located in the red barn on the corner of State and Columbia Streets, they were constantly finding dimes all over the place in the oddest spots. One customer swore to seeing a dime fly as she sat at her table. 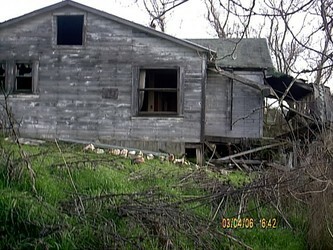 One of those owners had a vision of the woman who was responsible for the phenomena. 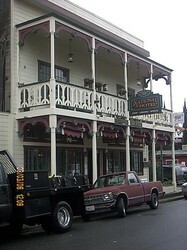 Today, the Sierra Gold Tea Company is an on-line business and the building is no longer open to the public. James Wilson was born on July, 14, 1826 in Norway. He was a shoemaker and came to Columbia by 1860. 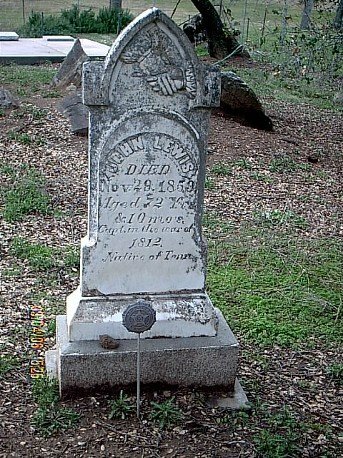 Rosine Rosasco married Wilson on June 1st, 1863 here in Tuolumne County. She eventually had five children with James. 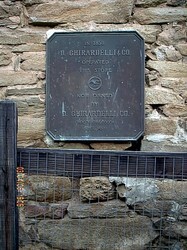 She was born in Genoa, Italy on September 10, 1840. She married into the Aste family and moved to Oregon and had three children her first husband. His fate is undetermined. 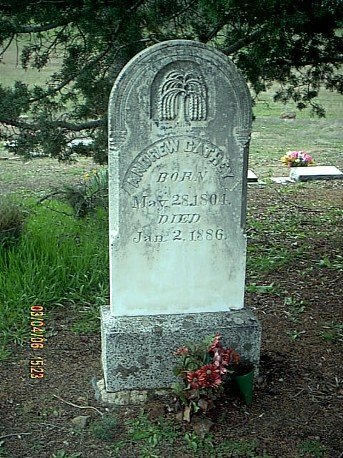 By the 1860's she was with her family in Sutter Creek. 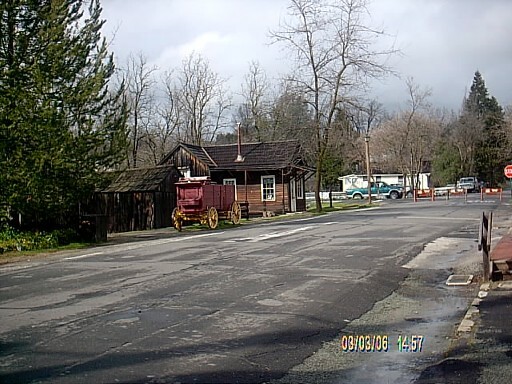 James Wilson's first shop, in 1860, was located on the middle lot of the three that would eventually be part of the land that the house was built on. 1867 James Wilson moves his shoemaking business into the brick building, his family lives behind the store. He shares the space with a barber and a daguerrotypist. James purchased the northern portion of the old Soderer-Marshall store, and moved his business from two doors up the street. 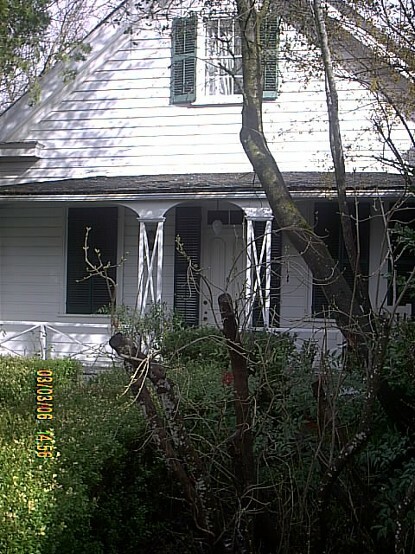 In the mean time Rose (as she was now called) and the Wilson family lived in the rear portion of the store. 1869 James Wilson buys out the interests of the others who had been sharing the new (Soderer) building and his business is the sole occupant of the brick store. 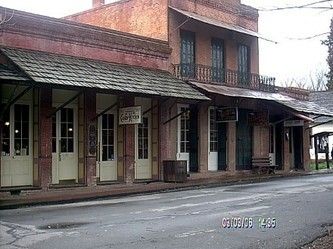 The building had housed the original store, run by James and Rose, was sold and mined out in the mid-1860's. By the mid-1870's, James had purchased these three lots immediately north of the store where his first store and two others had been located. 1876 James Wilson dies and his widow Rose takes over the business, with the help of her daughters Theresa and Annie. She eventually had a house built on the site in 1879. The house was attached to the Wilson store next door and the family could access the home through the rear of the store. The store now focused on clothing for men, not shoemaking. 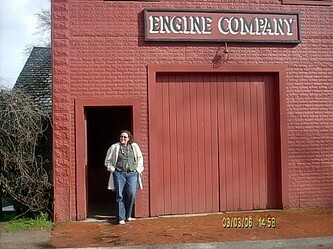 The business did well and remained open until Rose passed away in 1931. 1938 Theresa (age 79) and Annie (aged 72) close the business and move to San Francisco. 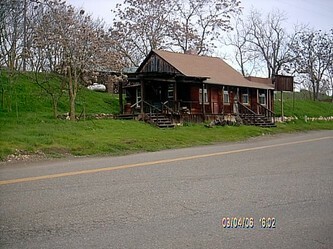 The home and store had gone through a couple of owners, with Mr. & Mrs. McConnell eventually purchasing the home. 1940 Dr. and Mrs. McConnell began to renovate the house with the help of a Williamsburg Architect. 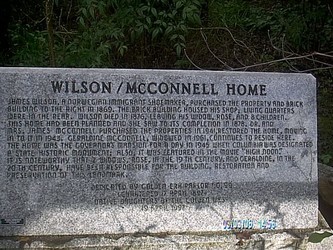 The McConnell's were instrumental in helping to create Columbia State Historic Park. They were very close friends with Governor Earl Warren, who they lobbied relentlessly to create the park. 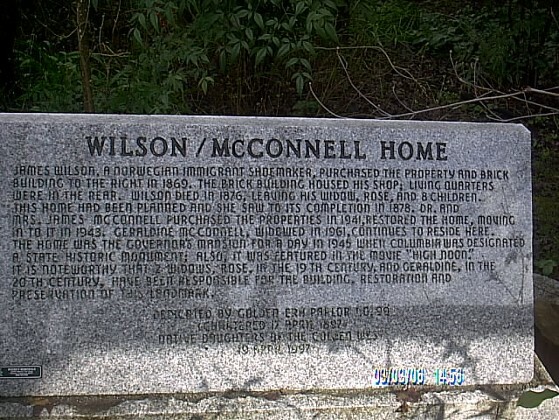 The park was signed into law in 1945 through the tireless efforts of Dr. and Mrs. McConnell. 2003 Mrs. McConnell passed away at the age of 99. 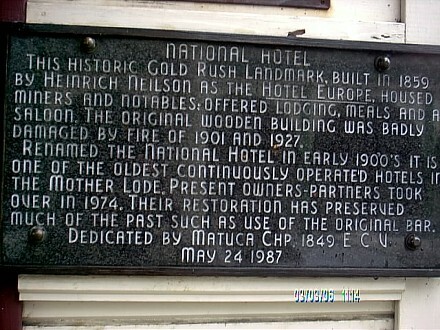 A woman checked into the National Hotel in 1897, often ing to the Sierra Railway Station in search of her fiance, John Davies, who left Quincy, Massachusetts in 1895 to work on the railroad and disappeared. Four weeks later, she was found dead in her room. A piece of paper on her nightstand addressed to John Davies declared her love for him and said she’d never stop looking for him. A local doctor said the cause of death was simply that her heart stopped. The woman’s name was lost during a fire, but now nicknamed Flo, her ghost stays mostly upstairs where guests report doors slamming, lights turning on and off. Some say their clothing has been dumped out of their suitcases. She is sometimes seen wandering through the dining room downstairs in the early morning. Daylight in Catheys Valley, California is precisely equal to day anywhere else in the United States, but this is a municipality where the undead stroll the lanes in the moonlight hours. Things go on here that can't be explained by science. 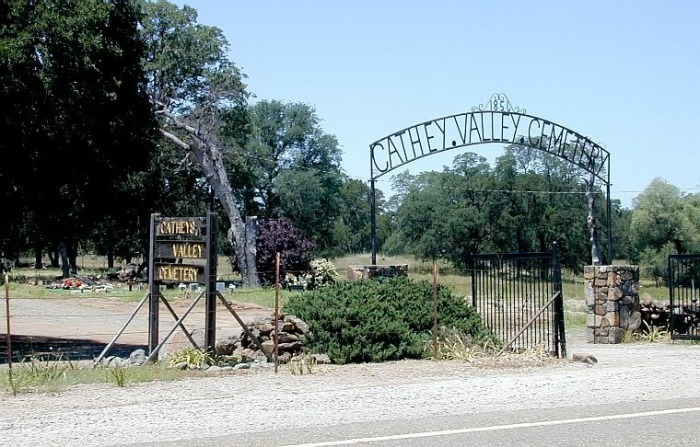 Doubters don't trust in the local ghost tales, but the ghosts of Catheys Valley are out tonight trying to find a person to frighten. These are some of the spooky things that have happened here recently. 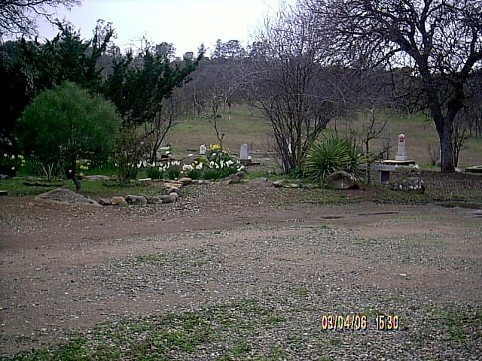 A woman with a semi transparent body can be spotted very frequently in Catheys Valley Park at midnight looking for a photo. The ghost of a man dressed in a law enforcement uniform has every so often been witnessed staring at the vista from the summit of Bald Hill after midnight. The ghost of a security guard with a bullet hole in his forehead has purportedly been distinguished on numerous instances looking over Bull Run Valley very late at night. 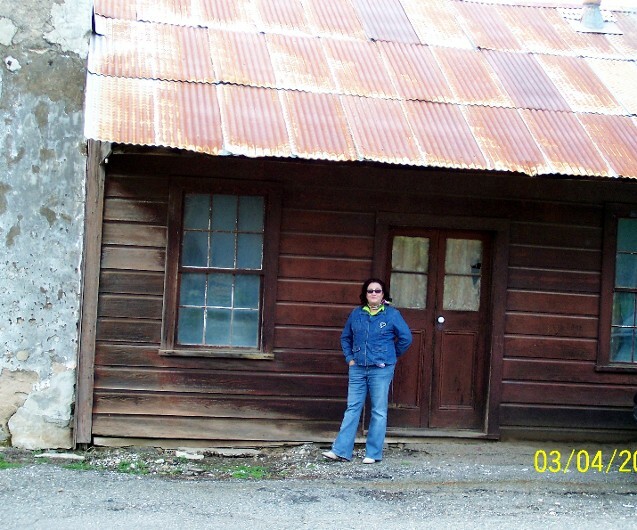 According to what the folks who live here assert, this ghost is that of a person who settled here in Catheys Valley a long time ago. The phantom of an elderly man with a big gray mustache can once in a while be noticed on a dark night scrutinizing Bellyache Canyon in detail. Loads of residents argue this phantom gets pleasure from startling foolish folks who are bold enough to upset the serenity in Catheys Valley. The ghost of a guy dressed in military attire was distinguished at the stroke of midnight drifting down on Bull Run. The ghost reacted to the witness.